Thoughts on the "leak" that was posted on reddit a couple of days ago? Some of this "leak" seems plausible. I mean I think we all agreed it'd be 10 Disney Worlds. Princess and The Frog was a shoe in IMO for a world. Not sure about Agrabah but won't be shocked if it makes it in since it still has The King of Thieves to cover and it's a great film. The iffy part is when they go list Nomura as a boss and then I definitely think it's fake. This is just an amalgamation of the most popular fan hopes/dreams over the last few years and not a leak. Some of the ideas sound neat and totally plausible to the point where I wouldn't be surprised if a few of them were real but I don't think this is genuine insider info. Jungle book is in the game so I immediately know it's not true. Itâ€™s a bunch of popular ideas turned into a â€œleakâ€. Ardyn will not be a secret boss because the Ardyn in XV is not the Ardyn Nomura designed, and that matters to him. The Nomura boss battle is the biggest laugh of the whole thing. Nomura hates seeing himself in photos on social media. What makes people think he would want to see a boss modeled after him? 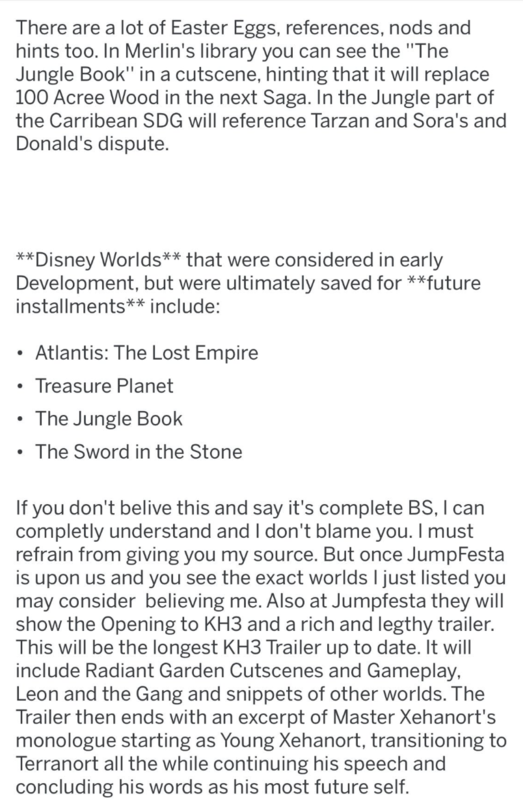 Most of this is fake, expect remaining Disney worlds. Those are correct. There will be no physical Disney cameos like the leak suggests. And there is certainly no Nomura fight, that should've been a giveaway. Tetsuya Nomura as a Secret Boss?! WTF? Am i going crazy or am i going Nuts? Oh yeah I saw this a few days ago XD. How would the Disney characters like Jack, Belle, and Prince Adam be able to leave their respective worlds? -Disney Worlds: Seem pretty plausible, but most of them are just the popular speculation and Pooh was already leaked. Nothing to really convince me one way or the other. 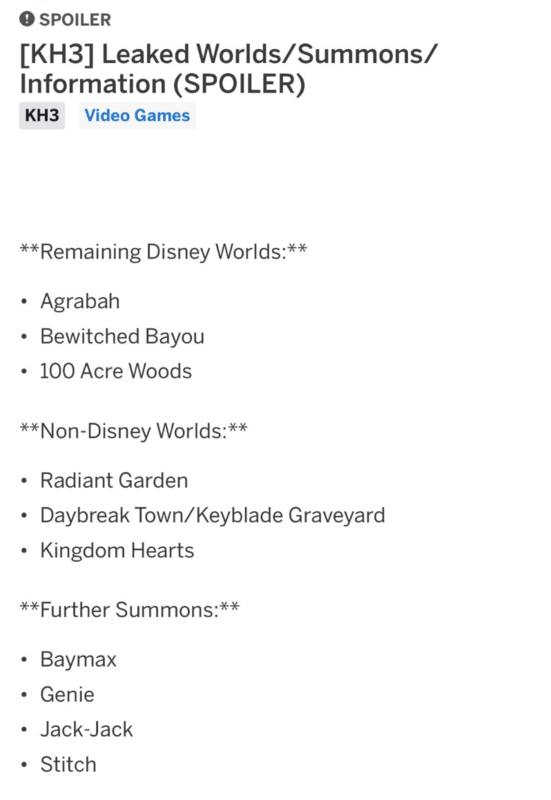 - Original Worlds: Also pretty popular speculation; Radiant Garden and Keyblade Graveyard have already been seen in trailers. -Summons: I feel like the summons in KH can be almost anything so I have no way of judging this list. 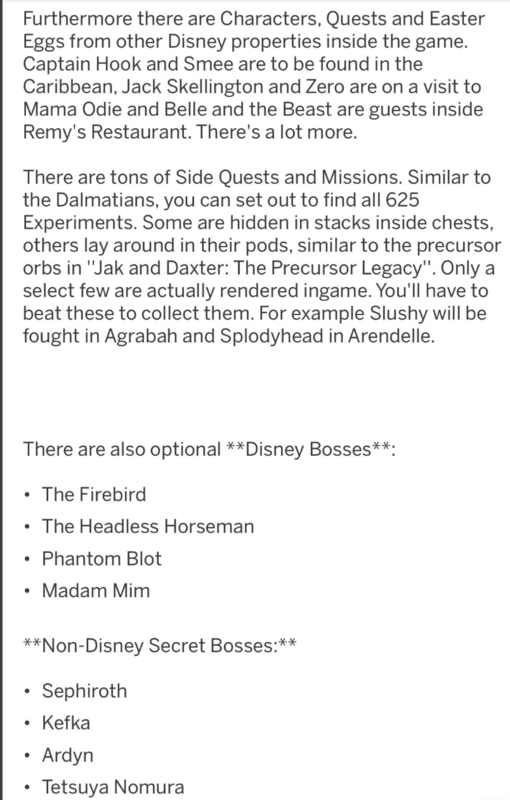 -Optional Disney Bosses: This seems like a lot of unique optional bosses, but they do all seem like good choices to meet outside their worlds and represent a good variety of popular and obscure characters. If the "leak" was just this, I might think it was plausible. -Non-Disney Secret Bosses: lol wut. No way is the notoriously camera shy Nomura going to put himself in the game as an optional boss. Ardyn seems pretty unlikely to show up either, given how upset Nomura still seems about what happened with XV. -Easter Eggs: These types of things sound like they would be pretty fun, though I can't believe that The Jungle Book is going to replace Pooh. -Disney Worlds Saved for Future Games: A lot of popularly requested worlds that seem unlikely to make it in. Our "leaker" knows how to pander to fans. So in conclusion, I find this leak to be super fake and mostly a compilation of previous fan speculation repackaged as what's actually going to happen. Though it would be hilarious if most of this stuff was true after all. Agrabah appearing again is the equivalent of the Piranha Plant being revealed in Smash, so I believe it. At least the ol' Monsters Inc. leak from months ago threw down some screenshots. This one is purely fanfiction, and I know it because they listed a Kefka secret boss, which I can't allow myself to believe. If they couldn't muster a better Setzer than the Struggle prettyboi (who honestly looks more like Kuja from FF9 than anything), there's no way in Hades that they would bust out the Mad God Clown. Only thing missing to make this "leak" perfect is confirmation of a Marvel/Star Wars world. Nomura being a boss clearly comes from Matsuda being a boss in NieR. But Jack Jack as a summon? Um, hell yes. I have no idea why my comment was merged with Mytomxxx's. Not sure why the person who made this thought Nomura would be a believable secret boss. Hell,Walt Disney would make more sense then him, lol. Wasn't there also talk of Matsuda being a FFXV DLC bonus boss? Y'know, back before they cancelled all the remaining FFXV DLC? Beast traveled to Hollow Bastion in Kingdom Hearts to save Belle. It's not unheard of for certain Disney characters to break the world order (Pinocchio, Merlin, Stitch and The Fairy Godmother). This leak is very "safe", so if anything becomes true, it'd be out of sheer coincidence. And for those wondering, Baymax can be a summon because there's the possibility of the contaminated Baymax being restored. At the end of the trailer, Sora seems to be norted and standing next to Xehanort and company, but then he suddenly turns and strikes Xehanort with an ethereal sort of Keyblade. alright guys hope you thought this fanfiction was cute, stay tuned for (not) more! The thing is, I know you're playing me, but also, I didn't realize I wanted this until now. the easter eggs with characters visiting other worlds lost me, since the whole concept violates the World Order rule. plus the Jack-Jack summon, Tarzan being mentioned, and i doubt Nomura himself would like being shown off as a secret boss. Wasn't Zidane supposed to be a summon too? With the "Yoink & Yeet" ability that first steals (Yoinks) a synthese item from the targeted enemy and then throws (Yeets) the opponent towards Sora for easy combo starters?